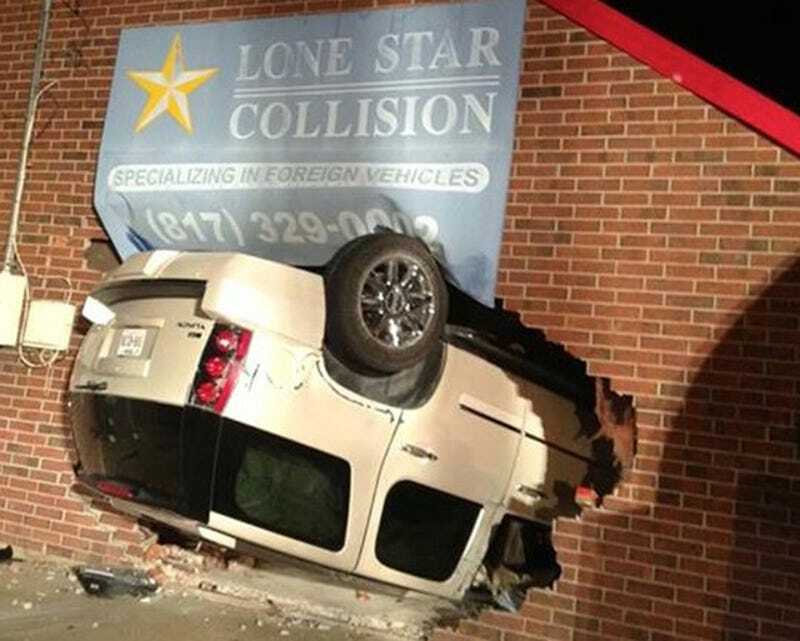 Clearly, this driver took the "Lone Star Collision" sign just a bit too literally. Then again, if you're going to crash your car into a building, why not do it at an auto repair shop? Now you don't have to worry about towing it. This hilarious photo comes from Colleyville, Texas where a GMC Yukon slammed into a sedan, rolled over, and slid on its roof until it experienced a collision with the outer wall of Lone Star Collision. MyFoxDFW reports that no one was seriously injured or killed. Police say they believe alcohol was a factor in the crash, and the Yukon's unnamed driver has at least one prior DWI conviction. Lone Star Collision's owner Jennifer Lapier told the TV station she was stunned by the crash. Business was back open Thursday, but slow, given the gaping hole. Lapier says she never would have imagined her collision repair shop would be the scene of an accident. "It is ironic that they did crash into a building that was a collision center," said Lapier. "Why not a donut shop?" Well, that wouldn't have been as funny.